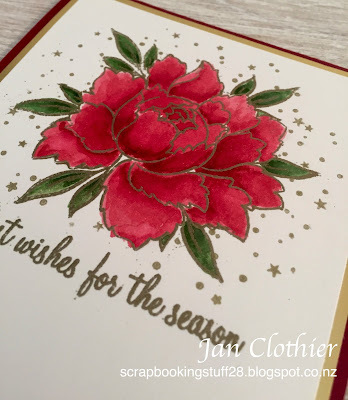 I thought I was over making Christmas cards but the sketch at Cas(e) This Sketch this week gave me a chance to try out an idea I've been thinking on for a few days. 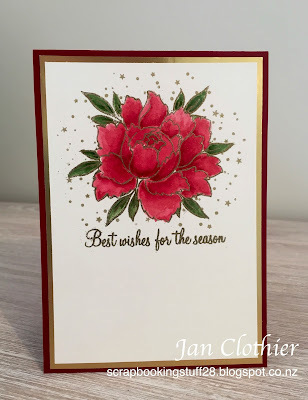 I've been thinking about using non-Christmas stamps for Christmas cards, like this beautiful peony from Altenew's Peony Bouquet set. And here is my non-Christmas stamp Christmas card. The main image might not be a Christmas stamp but you can't get a much more traditional colourway than Cherry Cobbler and Gold. It was also my first play with using Shimmery White cardstock to watercolour on. It does have a lovely shimmer in the paper too, that worked well wiht the gold embossing. Lots of masking happened also in this card. The flower was masked to add the leaves and both were masked out the add the starry background. 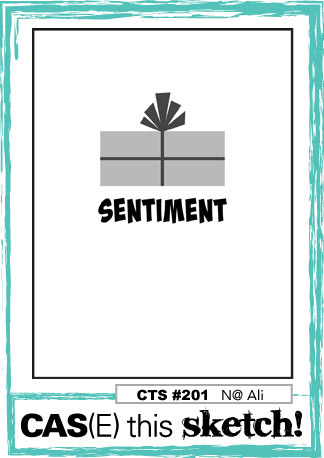 I'd certainly be happy to be sent this card, so I hope the eventual recipient will too! Other: Gold embossing powder, post-it notes, water and paintbrush. What a gorgeous flower. You've colored it so beautifully in the colors of the season! I like your idea to use a non-traditional image on a Christmas card! Thanks for playing along with us at CAS(E) This Sketch!